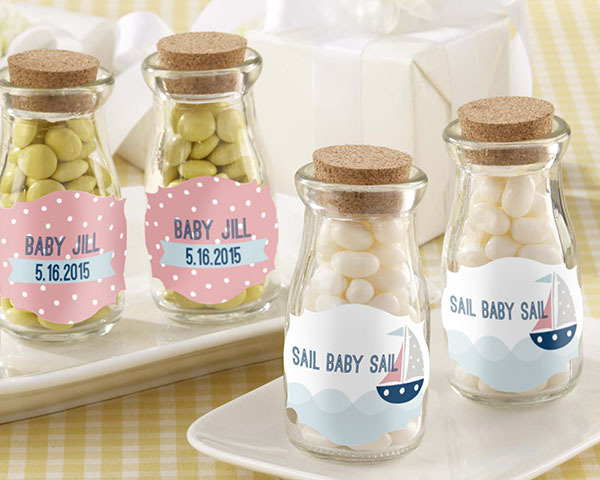 Get ready to be amazed by the cutest "Nautical Girl Baby Shower" you have ever seen! 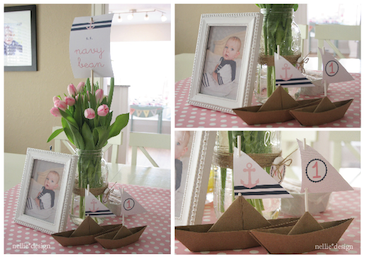 Nellie, from Nellie Design, recently threw her little girl, Navy (cutest name!) 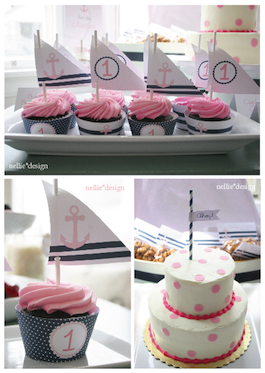 a little sailor party for her 1st birthday. When I saw all of the cute pictures from the event, I knew it would be perfect for a baby shower as well! The way the table leaf is folded down makes it look like a boat! 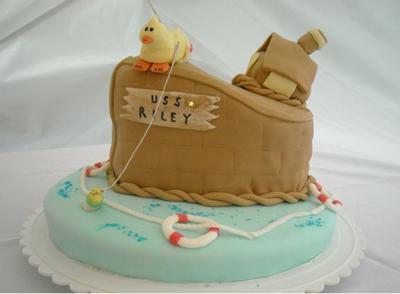 The polka dot cake is beautiful and I love the NAVY pennant banner in front! So sweet. 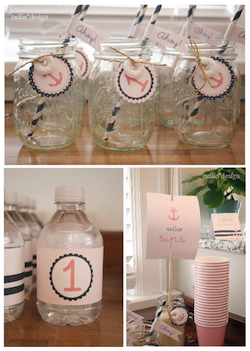 Cute coordinating pink and blue printables on the drink glasses and water bottles! Notice the mint Lifesavers tied to the Mason Jars to resemble life preservers. 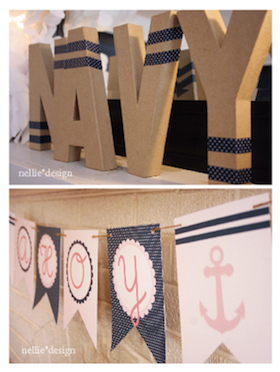 Love the navy striped straws and AHOY straw flags! 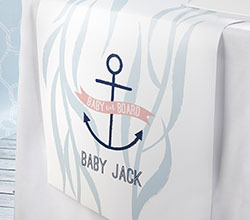 There are so many fun and creative possibilities to explore when decorating for a nautical baby shower! 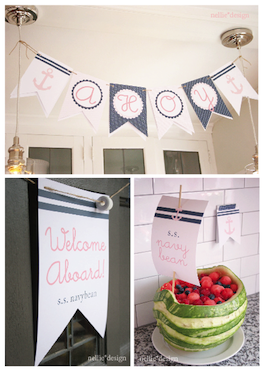 You can choose to go all out with banners, table runners, cute favors, etc. Or you can just incorporate a few cute things into the mix. Either way, it is sure to be an adorable success! 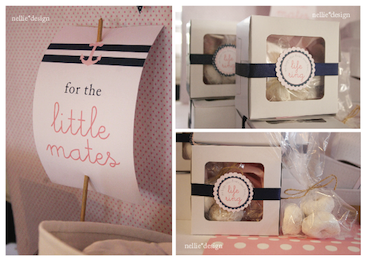 Such sweet little favors for the guests! The white powdered mini donuts look like life preservers too! 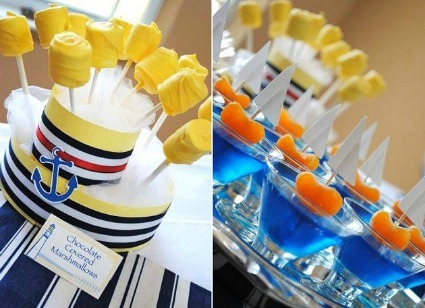 The creativity and adorableness that went into these "sailboat" cupcakes are just to die for! I love the simpleness of the polka dot cake too! The soft pink polka dot table clothes complete the look of this theme perfectly. 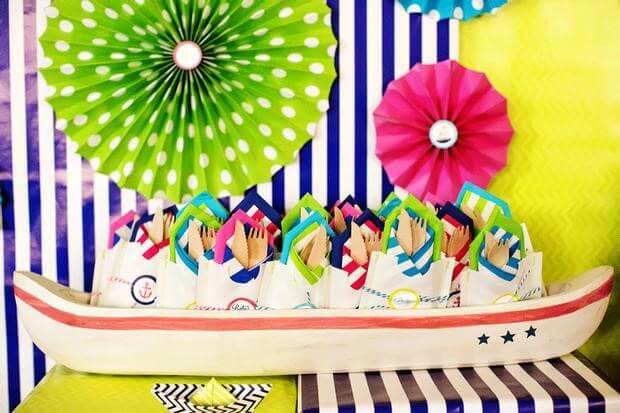 Don't you just love the craft cardboard boats? We talk more about these boats over at our ships ahoy! 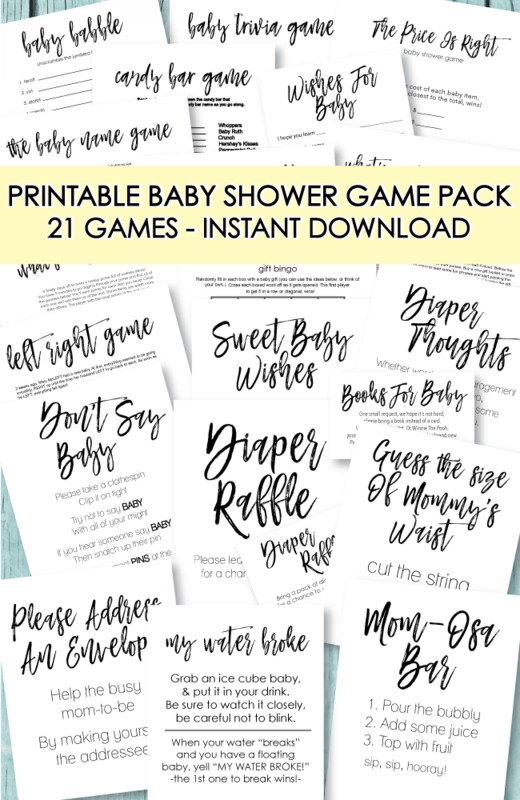 baby shower theme page. The watermelon "Boat" fruit bowl looks amazing and makes a wonderful centerpiece for the food table! You could use this same idea and spell out BABY - they have these big cardboard letters at Hobby Lobby or just about any major craft store. If you don't have a store nearby, simply do a quick internet search for "cardboard letters" and a bunch of sites will pop up where you can purchase them. What a great and simple idea to wrap a couple strips of ribbon around them! Cute doesn't always have to mean expensive! 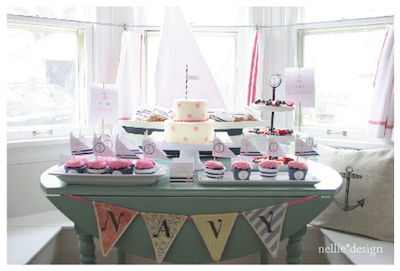 I want to give a huge thanks to Nellie for letting me share her daughter Navy's sweet 1st birthday party with everyone! 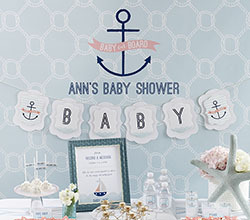 I hope it inspires all of you to host an amazingly adorable baby shower! 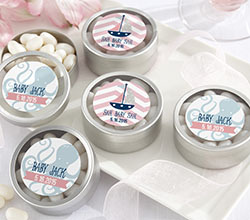 Find these and more cute nautical goodies here.